There are several lesser known national monuments in the American west that preserve the sites of important fossil discoveries, though in most cases all the exposed specimens have been removed so little of interest remains to see, such as at Fossil Butte in Wyoming. But not at Florissant Fossil Beds, 35 miles west of Colorado Springs in the foothills of the central Rocky Mountains, where the highlight is a group of petrified sequoia stumps, the largest 41 feet in circumference - all still upright and in their original positions, part of a pretty, pastel-colored landscape of yellow-green grassy plains bordered by low wooded hills. The sequoia (or redwood) stumps are the most visible and spectacular relics in the national monument, although the main discoveries in this area were many thousands of smaller fossils - plants, insects, fish, birds and mammals - which have been excavated from the thin-layered sedimentary rocks beneath the hillsides since the late 1800s when the significance of the location was first recognized. This region of Colorado was once covered by a large, shallow lake, surrounded by a dense, moist forest, flourishing during the late Eocene period around 35 million years ago. Examples of typical fossil species found here can be seen in a museum by the visitor center; none are visible to the casual observer in situ in the surrounding countryside apart from at a few limited sites used for modern-day excavations, which may only be visited if accompanied by a ranger. Away from these sites, and the sequoia stumps, the majority of the 3 by 4 mile park consists of empty, undulating land of streams, meadows, woods and valleys, crossed by 14 miles of trails - pleasant scenery, but no different to many other nearby places. The closest main towns with hotels near Florissant Fossil Beds are Buena Vista (61 miles west) Colorado Springs (36 miles east) and Manitou Springs (31 miles east) - follow the links for hotel descriptions and reservations. Partly because the park is quite small, and to protect the fossil resources, there is no camping within the national monument. Instead, paid sites can be found in various locations nearby such as Mueller State Park or Pike National Forest - this latter also offers free camping, such as along FR 240 south of Lake George. Florissant Fossil Beds National Monument is reached by a side road (Teller County Route 1, to Cripple Creek) that forks south off US 24 at Florissant (see map below), a tiny town of consisting just of a few dozen houses and several shops. The first notable site is the Hornbek Homestead, a cluster of aged wooded buildings about 100 feet from the road, set in the middle of a wide, grassy valley one mile wide, with tree-covered hills in the distance. This picturesque but lonely place was home to pioneer woman Adeline Hornbek, originally from Massachusetts, who moved here in 1877, at that time single but twice married and mother of four children. She successfully filed a claim for 160 acres in this as yet unsettled but fertile land, which although quite remote was close to a trading post at present-day Florissant, and had a reliable year-round supply of water (Grape Creek). The main dwelling was built in the first year, various outbuildings soon added, and the ranch land was used for growing crops and raising cattle, all remaining a thriving business until Adeline's death in 1905, age 71. Today, as then, the largest edifice is a two storey house, and although this has been partly restored, and the scattered smaller buildings were brought here from other historic sites nearby (the original structures having been removed by subsequent landowners), the place is still evocative and all the buildings certainly look authentic, with weathered timbers and rusty ironwork. The home contains a number of period items such as a bed, pictures, table, etc, which can be inspected close up on the few occasions when the homestead is staffed by the NPS; most of the time it is locked. One other part of the site is a 'root cellar', built a little way up a hillside to the north; this is a reconstruction of a structure once used by the Hornbeks for storage of food. The visitor center at Florissant Fossil Beds National Monument is one mile south of the Hornbek Homestead, at the end of a short side road - part of what seems a relatively large cluster of NPS buildings for this small and isolated park. The entrance fee (2019) is $7 per person, paid via the self-pay system at a booth just outside. Two large sequoia stumps are found just behind the center, both are protected by a metal canopy and supported by wires, so they do not look very natural. 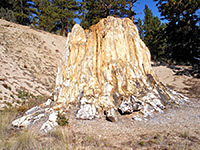 More stumps, smaller and less well preserved, can be seen on the quarter mile, paved Ponderosa Loop Trail through the neighboring woodland, including one that has a new tree growing out of the center. 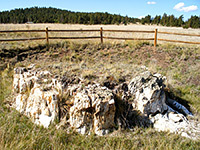 But the main specimens are along the one mile Petrified Forest Loop, which passes five well preserved stumps in a natural setting, unprotected apart from wooden fences - largest is the Big Stump, 12 feet across. Most of the path crosses open, grassy meadows, quite close to the highway. The trail also passes the Scudder Pit, one of the original fossil excavation sites, but which has nothing of obvious interest to look at. All the sequoia stumps, and the museum, can be seen in not much more than an hour. 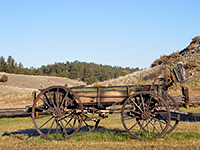 Florissant Fossil Beds is a day use area, open 8 am - 6 pm in summer, 9 am - 5 pm other seasons, and the side road is closed after hours, though there is nothing to stop visitors parking by the highway and walking along the various trails. Boulder Creek Trail (2 miles, loop) - Boulder Creek is a small tributary of Grape Creek, running past the sequoia area and across a marshy meadow towards the west edge of the monument. The loop trail around the meadow also encounters pine woodland, bushy hillsides and a cluster of rounded granite boulders; it starts 0.4 miles along the Sawmill Trail. 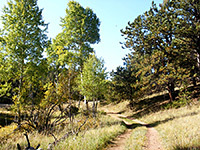 Hans Loop (1.2 miles, loop) - Hans Loop branches off the Sawmill Trail, starting by heading south along a wooded ridge almost to the highest point in the national monument (8,821 feet), and descending into the upper end of a valley, past an old cabin. The path then turns north and follows the shallow valley downstream, ending at a second junction with the Sawmill Trail. Hornbeck Wildlife Loop (4 miles, loop) - the longest trail in the area runs entirely through open meadowland, along the east and west sides of the valley; it starts at the visitor center, crosses the highway twice, intersects with several other trails, and also passes the Hornbek Homestead. Sawmill Trail (2.2 miles, loop) - perhaps the best choice for a longer hike in the national monument, this loop follows an old vehicle track over grassy slopes up to the top of a forested ridge, runs alongside the course of a seasonal stream through a narrow, partly wooded valley then rounds the side of a large meadow back to the visitor center. 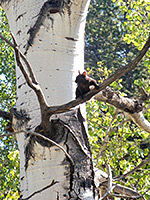 This is a good route on which to look for the characteristic all-black Abert's squirrels that inhabit the woodland. Shootin' Star Trail (1.2 miles, one-way) - most of this path is along a disused vehicle track; beginning from the Barksdale picnic area next to Grape Creek on Lower Twin Rock Road, the trail crosses a meadow and climbs into the ponderosa pine forest covering the neighboring hills. It crosses a low divide then follows a seasonal drainage down a shallow ravine to a junction with the Hornbek Loop at the edge of the main valley. Twin Rock Trail (1.2 miles, one-way) - starting along the Hornbek Loop, the Twin Rock Trail follows the edge of the hills on the east side of the valley then turns away up a shallow valley formed by a tributary of Grape Creek. The landscape is a mixture of aspen woods, flower-filled meadows, rocky outcrops and patches of riparian growth along the streamway.